Eco-friendly, artful designs made from recycled glass. Beautiful artwork made with attention to detail. Each piece is a focus on color, pattern and light. Our designs play with shadows, creating interest, depth, and movement. Created with fused glass jewels and locally sourced copper pipe and copper wire, there is a balance of tension between materials. Copper weaving of the glass creates an elegant and reflective result, offering a beautiful balance when displayed with other art or a strong statement when displayed alone. 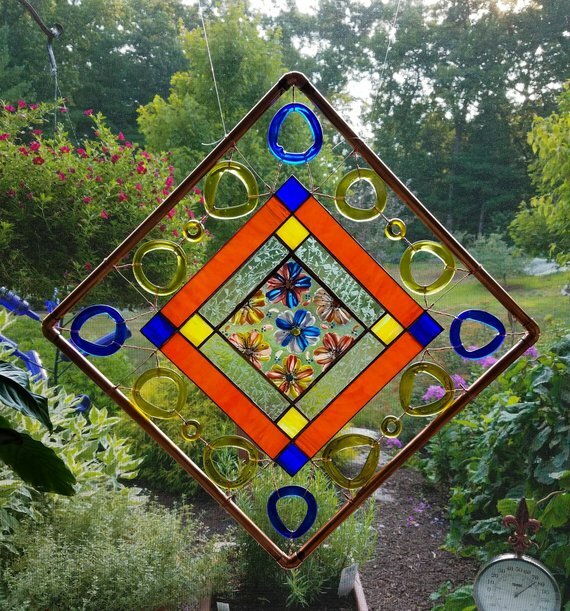 Each design can easily transition to a window suncatcher creating a jewelry-like window dressing. Unique and sustainable artwork for garden and home. Versatile designs that can be enjoyed both indoors and outdoors. All of our designs can easily transition from landscape and garden to window or wall. They are made of weather sturdy materials with careful annealing of the glass and sturdy copper wire and pipe. Unique and surprising when displayed in a landscape, garden items add color and movement. When used indoors, the copper weaving and glass jewels create an elegant and reflective result offering a beautiful balance when displayed with other art or a strong statement when displayed alone.